As the common language of Kazakhstan is Russian, most of the displays in the museum are in Russian, Although you can print off an English Guide to the Exhibits by clicking Here. 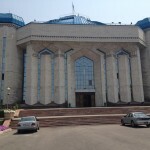 Entrance to the Museum costs 100 Tenge to see all of the General Exhibits which includes: An Archaeology section, An Ethnography section,Exposition of the Independence of Kazakhstan section and also the History And Diaspora Exposition Section. 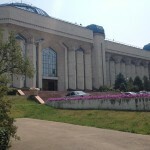 However there are certain sections of the Museum that you must pay extra to see, such as an area of Highly Valuable Gold Artefacts which will cost 1300 Tenge to see, The Hall of N.G which costs 1000 Tenge to see and The Exhibit museum of Anthropology named by academician Orazak Ismagulov which will cost you 1000 Tenge. 9:30AM – 5:30PM. Closed on Tuesdays. 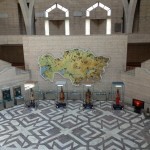 The Central State Museum is one of the biggest museums in Central Asia. Its history began in 1930s of the 19th century in Orenburg, when “The Museum of Orenburg Region” was founded in the Neplyev Military Academy. Collections of 3 existing museums – the Museum of Semirechye region, the Cossack Army and the Republican Anti-Religious Committee museums were added to the main collections of the Central State Museum. From the 1931 the museum was based in a building of former Cathedral, built in 1904-1907 by a well known architect from Verny – A.P. Zenkov. The modernday building of the museum was built in 1985 by a team of architects – Y. Ratushniy, Z. Mustafin and B. Rzagaliyev. At present the collection of the Central State Museum consists of more than 300 000 artefacts of worldly and religious heritage. 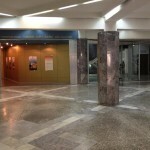 The museum has 7 main exhibition halls. The first hall consists of the paleontology and archaeology collections. There are artifacts from more than 300 sites from all over Kazakhstan in the paleontology collection on display. Of particular significance are unique rich osteological materials, fragments of petrified trees, remains with insects and fish imprints, microscopic endospores and plant pollen that are dating back to several million years. Archeological displays present scientific reconstructions of ancient funeral and ceremonial buildings, models of constructions of medieval architecture, dioramas made with the use of authentic archaeological relics. The museum experts have recreated ceremonial and military ammunition of a famous Issyk Golden Man – Honorable Saks Warrior. The Golden Man was restored by a well known specialist K. Altynbekov as a part of an innovative scientific project of archeologists Kemal and Alisher Akishevs. In the second hall you can see items of traditional Kazakh culture, life and household: rich collections of arms inventory of 18-19 centuries, jewelry, carpets, clothing and other items made of felt, a variety of Kazakh national embroidery and a full-size display of a nomadic house of Kazakh people – yurt, with its traditional interior. The most significant item of the collection is the original Beshmet, impressive sample of gold-thread embroidery of skilful Kazakh viewers. The item belonged to Fatima, wife of the famous Zhangir Khan – the last Khan of Bukeevskaya Orda. Do not miss the authentic military outfit of Arystan Sultan, decorated with ayats from Holly Koran (first half of the 19th century). Collection of the third hall is devoted to the history and culture of various ethnicities that have lived in the Kazakhstan territory. You can examine unique photos, rare documents, items of household, artefacts of arts and crafts activities of Russian, Ukrainian, Belarusian, German, Chechen, Ingush, Turkish, Kurd, Uyghur, Korean and other peoples, on display. There is also an exposition of “Kazakhstan during the World War II (1941-1945)” in the third hall. 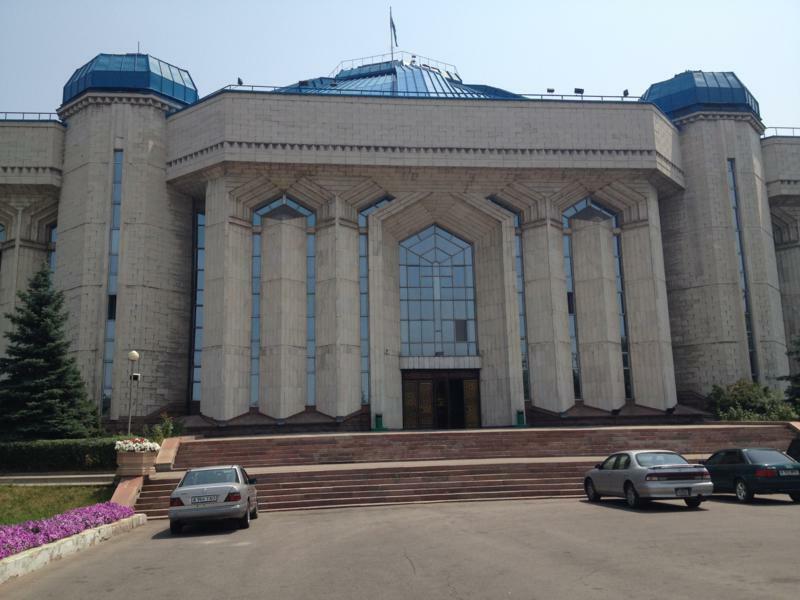 The forth hall is named “the Modern Kazakhstan” and represents the history of the Kazakhstan republic since 1991, when the country became independent. Symbols of the country (the republic): the emblem, the state anthem, the state flag, the original constitution of the Republic of Kazakhstan (dated 1995), the state awards, the banknotes, postal stamps made in Kazakhstan are exhibited in displays. 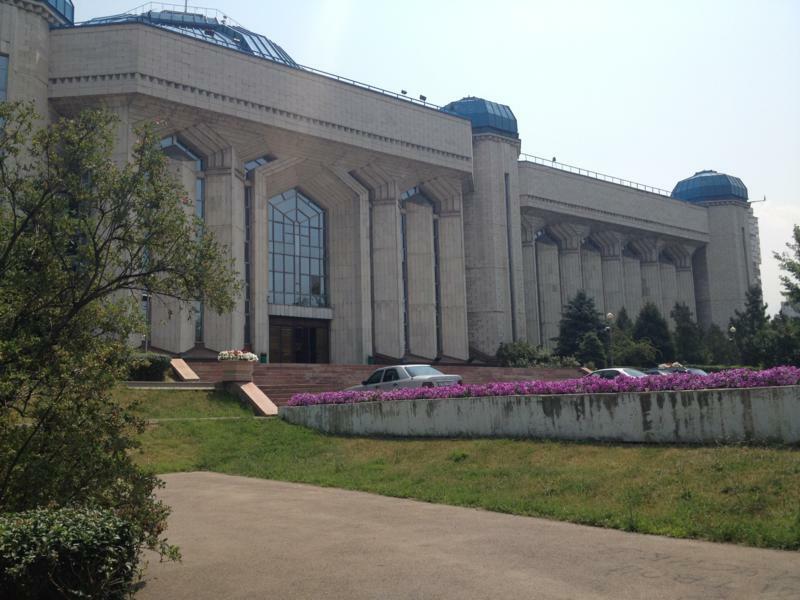 The hall also stores items representing the development of economics, education, health, culture, science and sport of the republic, and friendship gifts given to the first President of Kazakhstan. 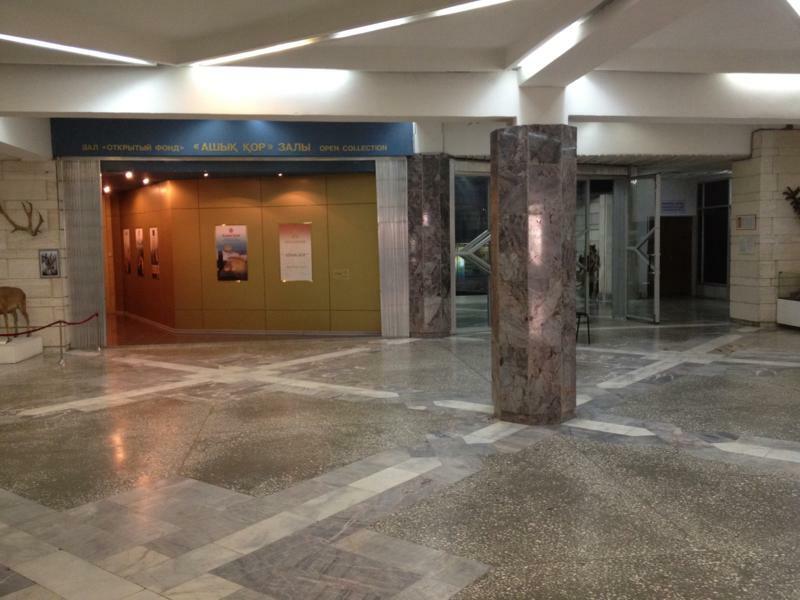 The fifth hall is called “Open Fund” – “Archaeological Gold of Kazakhstan”. The exhibition consists of unique artefacts from various regions of Kazakhstan: original items made of gold dating back to early nomads era (Saks, Savromats, Usuns) found in kurgans (burial mound) of Chilikty, Tarasu (7-6th centuries BC), Pokrovka (5th century BC), Zhalaulinskiy (8-7th centuries BC) and Kargalinskiy (2-1st centuries BC), also relics of treasure and monuments from OtrarKaratau culture (4-5th centuries AD). 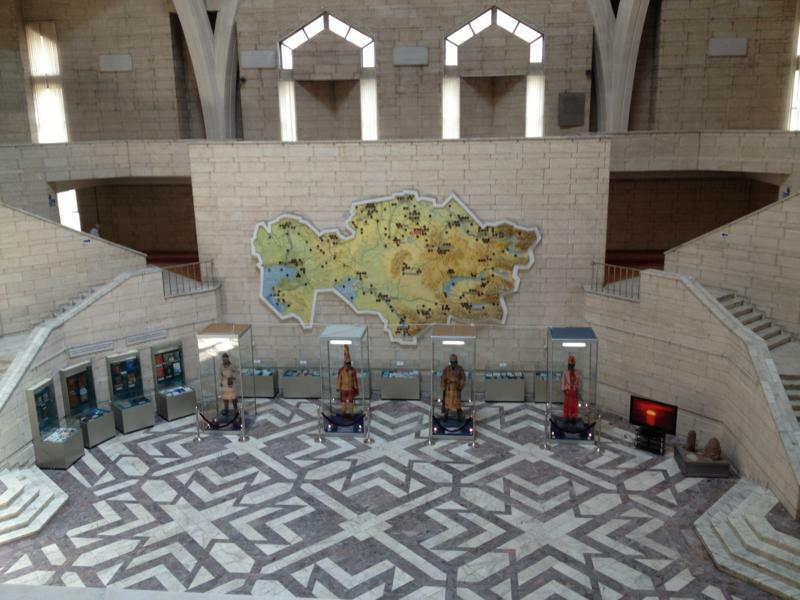 The sixth hall – “the Museum of Anthropology” is the only one in Central Asia. The display offers a unique journey into ancient times of humankind to “witness” primitive lifestyle of pre-historic people and the start of the civilisation. Display is devoted to the history of human development: the origin of people, first migrations across the continents and ethno-genetic history of the Kazakh nation.